Top Rank and MTK Global’s exclusive multi-year licensing agreement kicks off Friday, April 5 with a special card from Emirates Golf Club in Dubai, United Arab Emirates. Five bouts are scheduled to stream live and exclusively beginning at 12:30 p.m. ET on ESPN+ — the direct-to-consumer sports streaming service from The Walt Disney Company’s Direct-to-Consumer & International segment and ESPN. 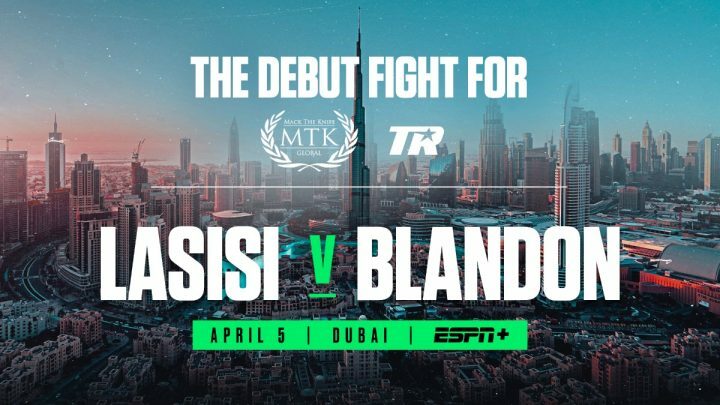 In the 12-round main event, Nigerian power puncher Aliu Bamidele “Lucky Boy” Lasisi (12-0, 8 KOs) will fight Ricardo Blandon (10-1, 6 KOs) for the vacant WBC International super flyweight belt. The co-feature will see Irishman David Oliver Joyce (9-0, 7 KOs) battle Stephen Tiffney (10-1, 4 KOs) in a 10-rounder for the vacant WBO European featherweight strap. Lasisi’s last bout was a dominant unanimous decision over Mchanja Yohana in December. Blandon, who hails from Managua, Nicaragua, has won three straight bouts by knockout and will be making his first ring appearance outside of his home country. Joyce, who represented Ireland at the 2016 Rio Olympics, is coming off a six-round unanimous decision over Jorge Rojas Zacazontetl last October at Hulu Theater at Madison Square Garden. Tiffney has won two straight since a decision loss to Lewis Paulin (10-0 at the time). Up-and-coming super middleweight Mateo Tapia (9-0, 5 KOs) will face Gaganpreet Sharma (8-1, 4 KOs) in an eight-rounder. Shakhobidin Zoirov, who captured a bronze medal at the 2016 Rio Olympics for his native Uzbekistan, will make his professional debut against Anthony Holt (5-4-1, 3 KOs) in a six-round featherweight contest. Lightweight prospect Majid Al-Naqbi will make his professional debut versus Vladimir Lytkin (0-2) in a four-rounder.